As we reflect on the past six years of sMiles 4 Sammy races, we are amazed at the support and blessings that have come from this special event. As we begin to look forward and plan for 2018, our planning team has made the decision to not host a 5K this year. Due to continued rising costs and restrictions associated with permits required with this type of event, we feel the time has come to explore different options to continue the mission of sMiles 4 Sammy to support and encourage the families of medically fragile children. Our team would appreciate your prayers as we look for an alternate avenue to continue to fund this ministry. We remain committed to fundraise once annually to support the sMiles 4 Sammy mission for the entire year. 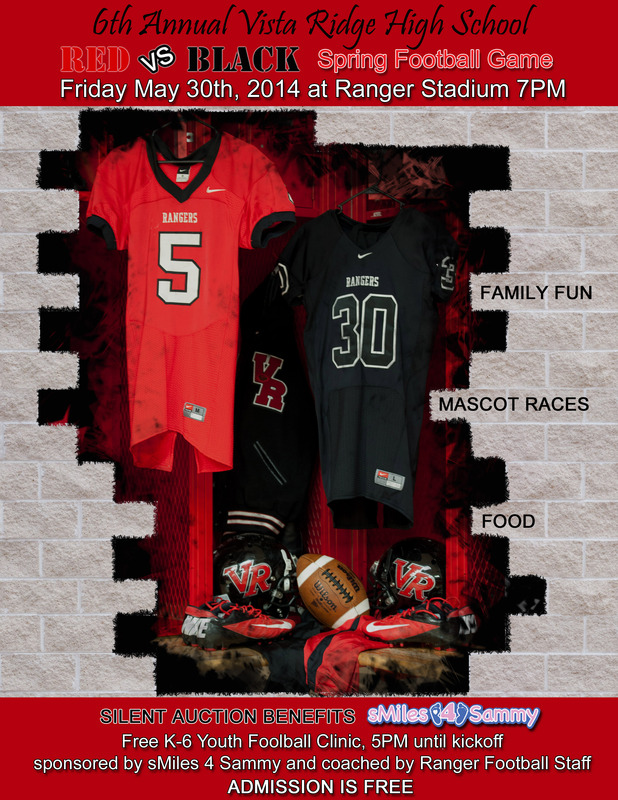 With that being said, we are blessed to move forward with our 7th annual silent auction at the Vista Ridge Ranger Spring Football game on Thursday, May 24th, and hope you will join us for this fun event! In addition to hosting the silent auction and concession sales, we are excited to share that the sMiles 4 Sammy Kids’ 1K will be held during halftime of the football game! Please look for an email in early May that will unveil details about our future endeavors and how you can continue to be a vibrant part of this mission. As always, we would love for you to follow sMiles 4 Sammy on our Facebook page and at www.sMiles4Sammy.org. Thank you for 6 GREAT races! We are amazed at how much we were all able to accomplish together, and we are excited to watch how sMiles 4 Sammy will continue to grow!